What is dogstaking, or “reverse flying”? 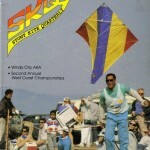 When I started flying, it was all about just learning quad and dual line flying – learning the controls, building muscle memory and the like in order to put the kite more or less where I wanted it to go… At the same time, I was reading every issue of Stunt Kite Quarterly and American Kite Magazine I could get my hands on, which were both providing “star quality” coverage of the best fliers around. 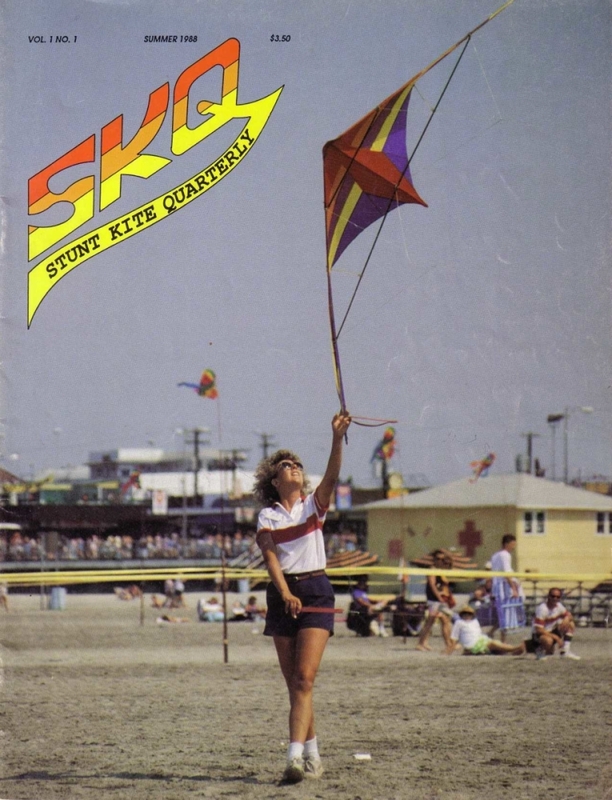 Left: Sue Taft on the cover of Stunt Kite Quarterly #1, flying a dual line Spectrum Dart. 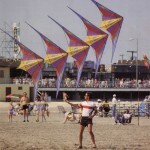 Center: Lee Sedgwick, flying a five-stack of quad-lined Spectrum Darts. Right: Robbie Sugarman, flying a dual line Peter Powell diamond. 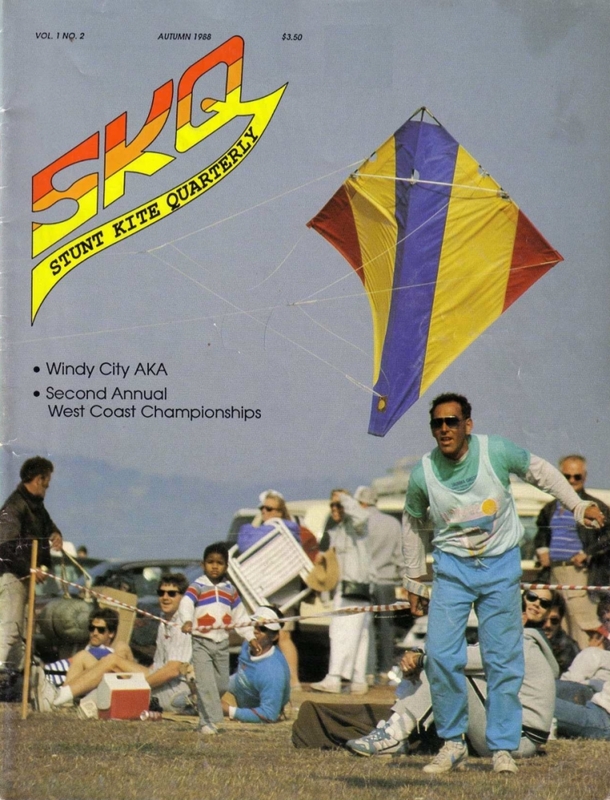 The style of flying most commonly referred to as dogstaking, reverse flying or solo flying was pioneered by Lee Sedgwick of Erie PA sometime around 1986 or 1987… Most definitely, the first mainstream appearance was Lee’s classic Lady in Red routine at the 1987 East Coast Stunt Kite Championships in Wildwood, NJ. 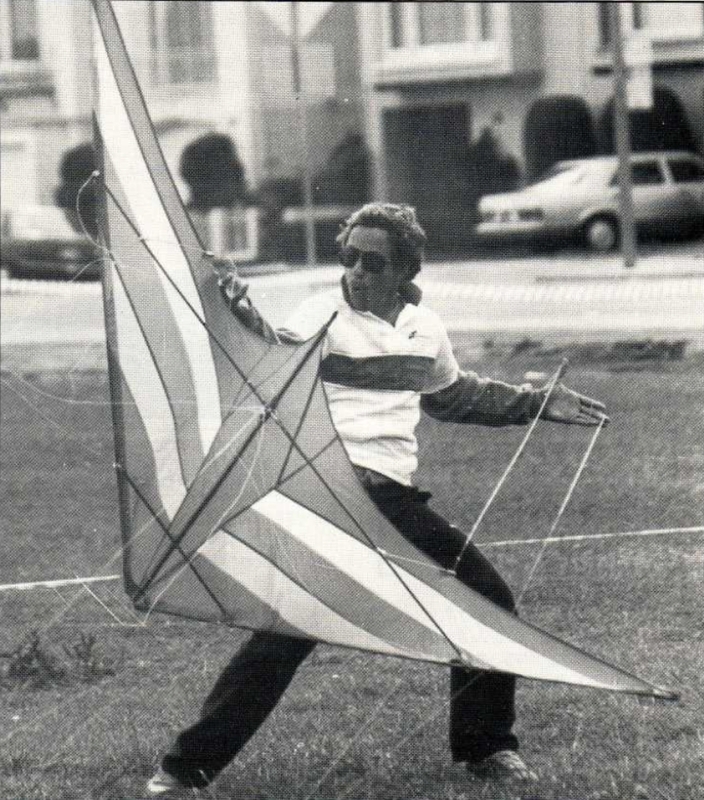 Interesting to note, he entered Open Individual Ballet… At the time there was only one ballet category for sport kite competitors, they were divided only by skill level (Novice, Experienced, Open) – doubling one’s lines through a stake and interacting with your own kite was so different than anything they’d seen before that a new, more undefined category called Open Innovative was created(although the name was later changed to Open Freestyle). 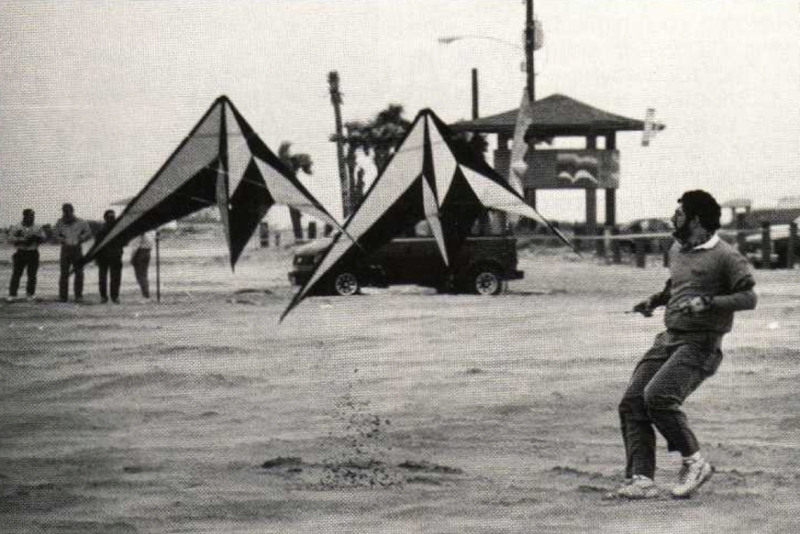 Left: Malcolm Moore flying dual line. 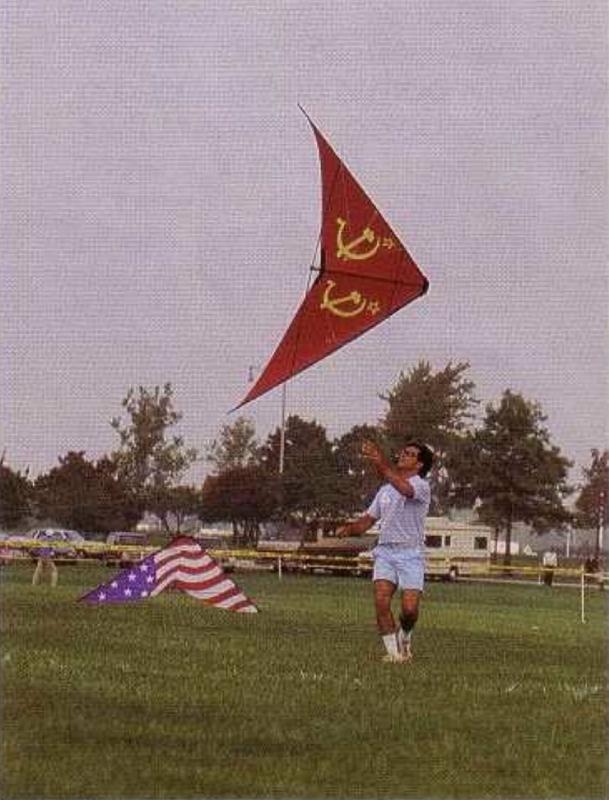 Center: Eric Wolff flying a Firedart dual line. 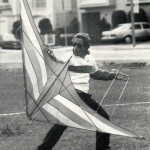 Right: Lee Sedgwick flying a Rev I quad line. Why is it called a dogstake? 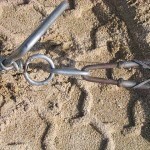 While the actual line mechanism employed varies a lot from rig to rig, the most commonly used stakes (the part in the ground) are those traditional screw-shaped things you get at the pet store for leashing a dog in the yard, hence the name. 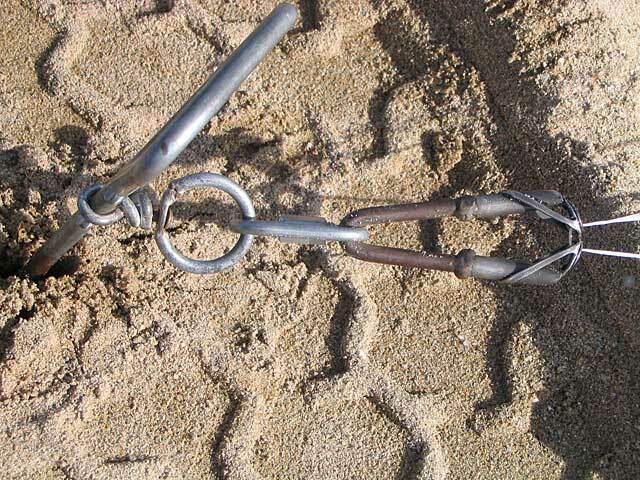 Back in “the old days”, most folks ran their lines directly through the triangular head on a traditional dogstake but due to the resistance (friction), there have been a lot of variations using everything from ceramic rings to ball bearing pulleys. 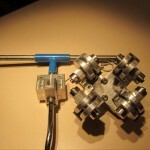 I have to say though, if you have a good mechanism, individual pulleys or rings for each line are WAY better since they can move freely without fighting one another as they do when passing through a single ring or pulley… The ideal set up reduces the friction, giving a smooth rate of control without binding or excessive abrasion on the lines. 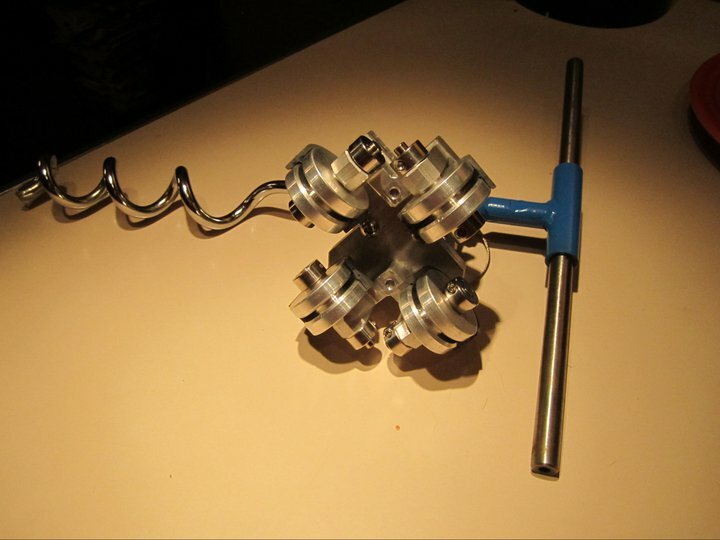 My old rig – single ring, all four lines run through. 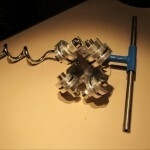 My new rig – four separate pulleys, each line is independent. 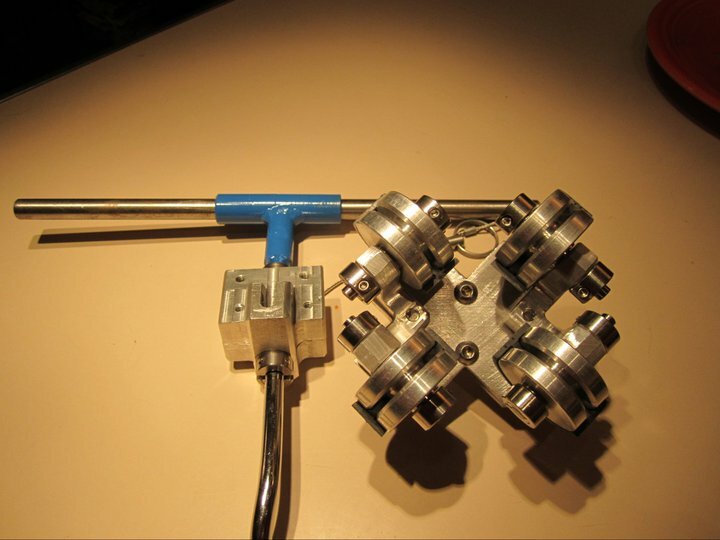 You can see my first one (used 2009 to 2011) was just two polished ceramic rings in fishing pole tips, attached to a U or V shaped mount… The new, current one uses four separate ball bearing pulleys, one for each line. 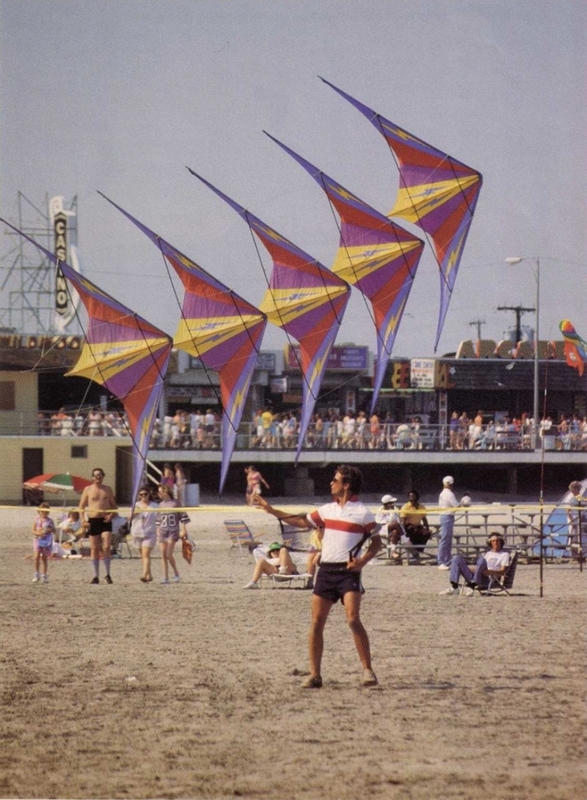 It’s important that you never underestimate your kite when flying dogstake, especially in higher winds… You’re directly downwind with the kite, so one badly-timed input can send a big kite crashing into you at high velocity. I strongly suggest always, ALWAYS wearing good sunglasses to at least protect your eyes. Depending on the rig, you can also damage your lines with so much wear going on… Using ceramic rings, I’ve gone through a brand new set of Laserpro Lines in a single day of flying, although using pulleys tends to significantly extend the life of my lines. Most importantly, it’s critical to be aware of potential danger to others… Especially if the kite gets clear to the opposite side of the window, it’s very easy to get confused and that loss of control could send the kite diving into someone else… You know better than they do, it’s always OUR responsibility as a flier to set up where we won’t be a hindrance to someone else’s leisure. The controls can be backward, depending on both how you are set up, and what your perspective is. 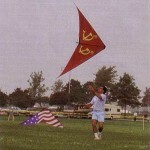 As you can see in Lee’s classic Lady in Red routine, he hooks into his dogstake while he is still flying… The kite never lands for more than a second or two… If indeed he never swapped L/R handles, then it means his controls were reversed (by his perspective) for the better part of his performance… An amazing display of kite mastery! True right handle is in my left hand, true left handle in my right. 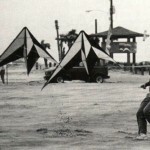 I look at the back of the kite and pretend it’s the front. 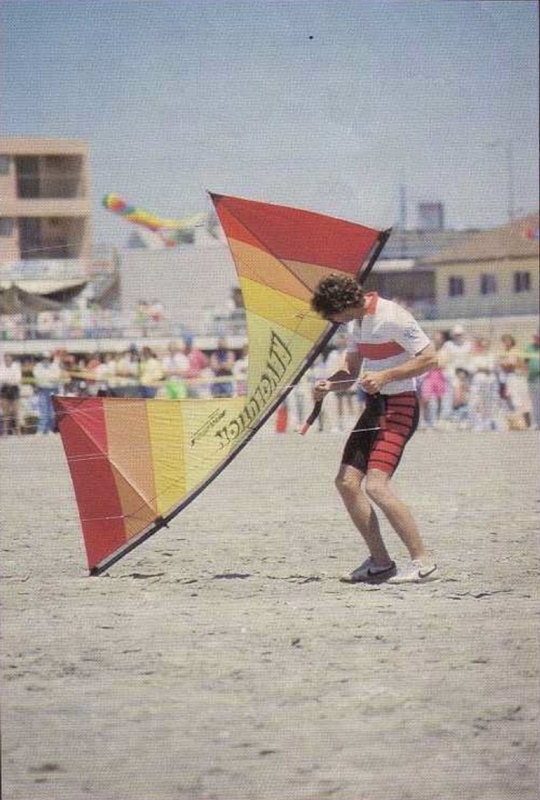 Once I had a smooth-running pulley rig and got over the strangeness of being downwind, it got easy. For Revs, I often use 1-2 knots heavy on the forward (less brake/reverse) so that I don’t have to pull the kite so hard to load up… Otherwise, I’m set up more or less normally. 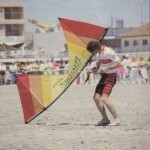 With a dual line kite, you might set the bridle for easy lift and less pull… I also prefer to use straps instead of handles, so that I can use my hands and fingers to interact with the kite freely. 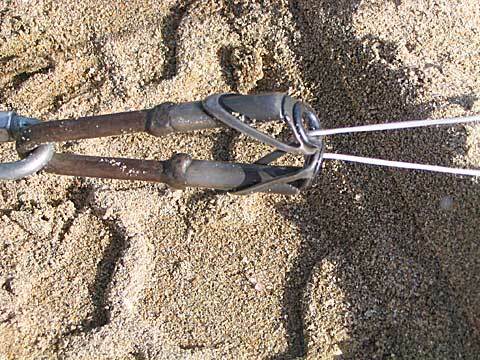 Lee had a pretty cool technique for his quad-lined deltas where he didn’t use handles at all – instead, he used a heavy cord with knots in it (see picture at right)… Instead of changing the angle of handles, he’d use his fingers to play those cords in and out as necessary. 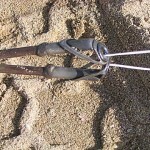 I’ve heard of folks using various substances to lubricate the lines somehow, but I’m sorry to say I don’t have any details on how or what they used… I’m not keen on messing around with such details myself, but I’d certainly welcome any relevant experiences our readers might be able to share. A critical item to understand is that when you run your lines through a dogstake, the actual flying length is cut roughly in half – greatly reducing the size of your wind window. It’s less of an issue with Revs due their hovering ability… I use my usual 120′ (60′ flying) length, but you may want to use longer sets of lines with your dual line kites since they’re quite a bit quicker and have to keep moving. I think most dual line trick fliers use 75′ to 110′ normally, so it’s safe to say they might want 150′ to 220′ total length. This was meant to provide a basic introduction to the concept and a handful of the main aspects, please feel free to ask questions or add some of your own info and photos… This should be an “open source” discussion, it’s a very cool flying style that everyone should have a chance to try with all the right info, if they’re interested. Thanks for reading, I look forward to learning more with all of you. This entry was posted in 2011, General Topics, Issue 81 (Nov/Dec), KL Archive and tagged dogstake, editor pick, innovative.